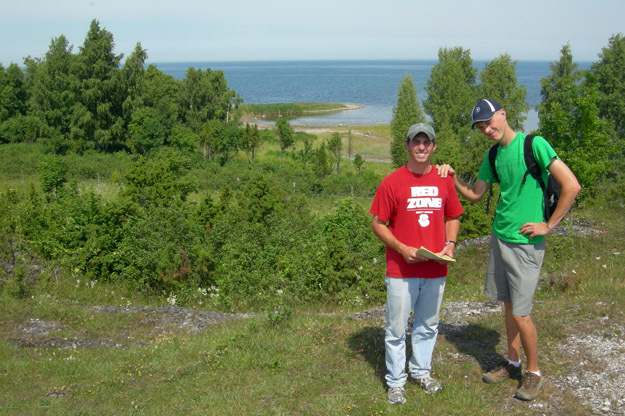 Rob McConnell and Palmer Shonk at the Uugu Cliff locality, Muhu Island, Estonia (N58.67136°, E23.23988°). The blue Baltic Sea is in the background. KURESSAARE, SAAREMAA ISLAND, ESTONIA–Like the Iceland team, our first full field day in Estonia was spent in reconnaissance on the islands of Muhu and Saaremaa. We visited an abandoned quarry just north of Koguva to examine Lower Silurian (Wenlock) dolomitic mud mounds and limestones near Koguva, and then went to the Uugu Cliff which exposes a similar sequence but a little younger within the Silurian. Caves are found high in the cliff which were cut by waves of Ancylus Lake, a freshwater precursor of the Baltic Sea between 9500 and 8000 BCE. 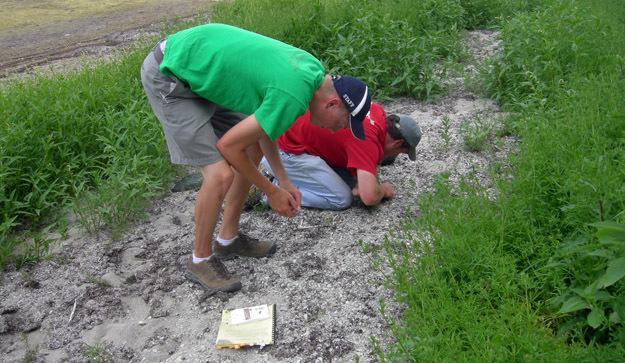 There are also trenches on the top of the bluffs dug by Tsarist Russian soldiers during World War I.
Palmer and Rob in the traditional fossil collecting position at Paramaja Cliff (N58.61531°, E22.89790°). Palmer was not particularly happy about the long walk through the stinging nettles. Tomorrow we continue our survey of Silurian localities. The weather could not be better. (It sure beats sleet in Svalbard and mosquitoes in Russia, I must say!) Rob’s luggage is scheduled to arrive at our Kuressaare hotel in the afternoon, so we’ll finally have our full kit.